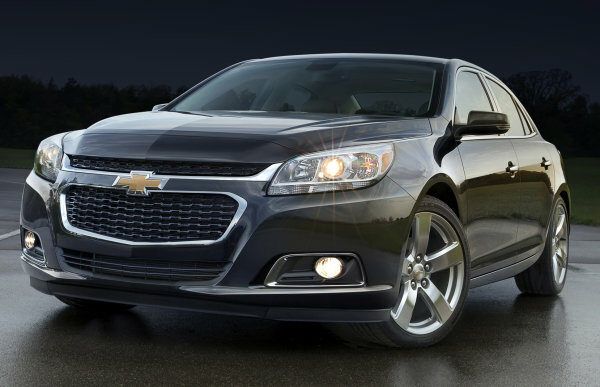 The 2014 Chevrolet Malibu base model fitted with the 2.5L 4-cylinder engine and a 6-speed automatic transmission offers 25 miles per gallon in the city, 36 miles per gallon on the highway and a combined figure of 29mpg. GM was able to reach these impressive figures – numbers that allow the Malibu base model to beat both the Ford Fusion and the Toyota Camry in base form – by adding start-stop technology, Intake Valve Lift Control and revised transmission gearing. These numbers are up from the 22 city and 26 combined offered for the 2013 model year. Those numbers are identical to the figures achieved by the 2014 Chevy Malibu Eco that is fitted with GM’s eAssist mild hybrid system – a package which costs $2,990 more than the base Malibu for the 2013 model year. The 2014 Malibu eAssist offers the same 25mpg around town, 36 highway and 29 combined as the base 2014 Malibu and while the city and combined numbers are identical to the 2013 model year hybrid Malibu sedans, the highway fuel economy actually drops by 1 mile per gallon. The fact that the more expensive Malibu Eco with the hybrid eAssist system costs so much more than the 2014 Malibu base model leaves us wondering why anyone would buy the 2014 Malibu Eco. The justification of paying more for hybrid technology is that you make that money back at the gas pump but with literally no advantage in fuel economy – the already slow-selling Malibu Eco may become an even hard sell for Chevrolet dealerships. It is likely that the people who buy the Malibu Eco going forward with be “image buyers” who are more concerned with being able to say that they drive a hybrid than they are about actual fuel economy or they will be hyper milers who expect that with some erratic driving maneuvers – they can achieve much better fuel economy than what the automaker and the EPA predict. While this would seem like a bad move for General Motors, as it will almost surely cut into the already poor sales of the Malibu Eco hybrid, it could also be spun into a positive for the low cost base models. GM will be able to boast that they offer one of the most efficient base model midsized sedans on the market while also being able brag that they have a low cost base model that offers hybrid-like fuel economy. In short, those people who would have purchased the Eco package based on fuel economy will likely just turn to a 2014 Malibu with the base model engine while those buyers who want the best fuel economy for the lowest price will be enticed by the new Malibu. The 2014 Chevrolet Malibu Turbo model packing the higher performance 2.0L turbocharged 4-cylinder “only” offers 21 in the city, 30 on the highway and 24mpg combined but that model also packs 259 horsepower and 295lb-ft of torque so while the fuel economy isn’t the best – the performance is significantly better for those prospective Malibu buyers who have a need for speed.